Should you choose training software to manage your in-company courses? In-house or in-company training refers to the delivery of training at a client’s premises or at a venue of their choice. This allows for a more tailored experience for learners and can be more cost effective for the organisation requiring training. 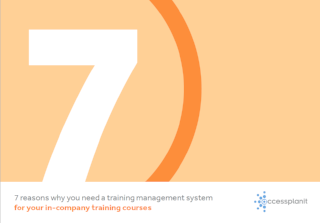 In our free eBook, you'll discover how training management software can help to improve your services, delight and retain your clients and streamline course and resource scheduling.